Ilyere here! 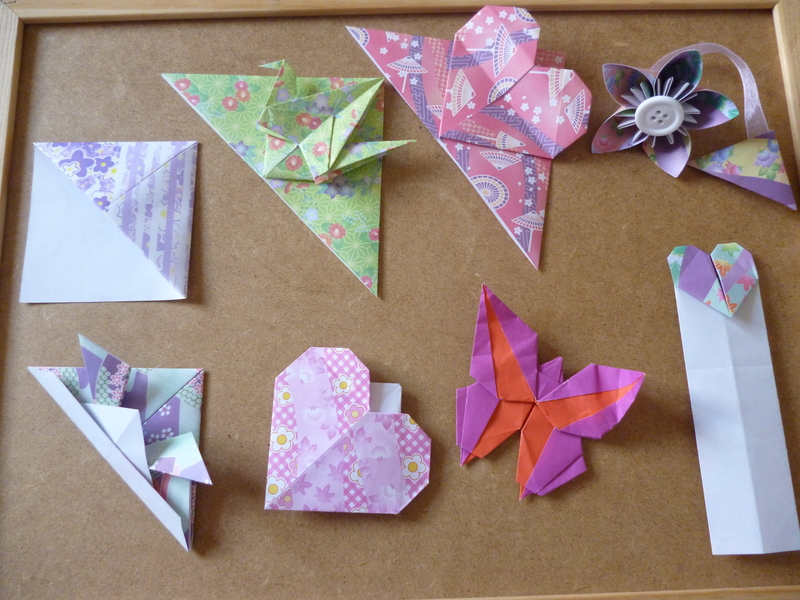 Today’s feature will be on origami corner bookmarks. Any avid readers here? An origami corner bookmark is a lovely way to ‘accessorise’ your book, plus they’re fairly easy to make. For most of mine, I made using a 15cm square of paper, and as such they come out pretty large. I then tried a 7.5cm square, and then it came out too small. Perhaps for a good size, you should try in-between at 10-11cm? You’d have to cut the paper yourself then. For the last one, I had a leftover piece of paper of 7.5 by 15cm. With a length like this, you can make a normal rectangular bookmark with a cute motif on the top, like my heart one. These ones are more ‘visible’ compared to a corner bookmark, so be careful when putting the book away! So in summary, a square piece of paper creates a corner bookmark. Cut your square in half to give you two pieces of paper for making a rectangular bookmark. The authors of L2Origami thank you! We are pleased that you find our blog useful :). You and your friends are welcomed here any time!